Sirens Greentube and San Ġiljan TUM Invest won the right to contest Tuesday’s ENEMED Cup after their victory in yesterday’s semi-finals at the National Pool. Sirens clawed back their way in the third session to surprise Neptunes with their 9-8 victory dismissing their opponents’ hopes of winning the cup. On the other hand, the Saints easily overcame the feeble challenge put up by Sliema. A gallant Sirens won the right to meet San Ġiljan in the final of the ENEMED Cup after coming from behind to defeat Neptunes 9-8. Trailing 4-2 at the start of the third session, Sirens began to crawl their way back into contention, and with some determined play, they managed to turn the tables on their opponents to register an important win. 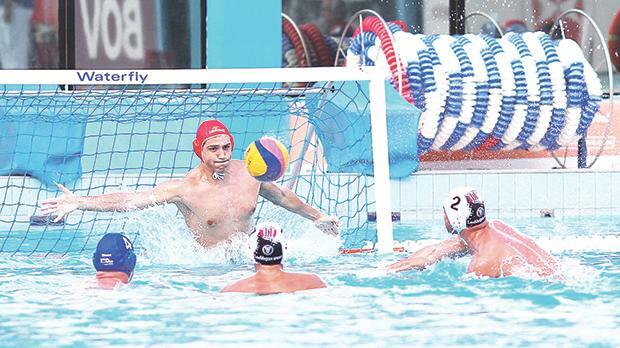 Isaiah Riolo punctured the Neptunes’ fort no fewer than three times but goalkeeper Nicholas Grixti was the real hero for Sirens as the Malta custodian saved a penalty 10 seconds from time. The real turning point arrived midway in the third session with Sasko Popovski’s outfit hitting their stride to net four goals, and taking a 6-5 advantage after having been 5-2 down at that point. A partial comeback in the last session had Neptunes closing in on 9-8 but their captain Niki Lanzon missed a decisive penalty to hand Sirens a place in next Tuesday’s final. San Ġiljan ambled through to the final in their bid to defend the title won last year. There was no question about their superiority as Marko Orlovic’s men were streets ahead. The feature of the match was San Ġiljan’s Dino Cachia. He netted seven goals, a record haul for the ENEMED Cup. Apart from that, Matthew Zammit also stood out with three goals, one of which was of vintage quality. San Ġiljan made their intentions clear in the opening sessions after establishing a 6-2 platform with Dino Zammit scoring two early goals. A 3-1 scoreline in the third session made it 9-3 for the Saints. By then, Matthew Zammit had scored five and Dino Zammit three goals. Sliema tried hard to stick to their job of making a fight out of it but, San Ġiljan making use of all their tailenders, were beyond reach as they won 12-5. Neptunes: A. Borg Cole, N. Lanzon 2, K. Erdogan, G. Pace 2, M. Martellacci, J. Farrugia, J. Muscat 2, S. Busuttil, J. Abela 2, N. Zammit, I. Zammit, V. Ragone, B. Busuttil. Sirens: N. Grixti, J Ciantar, E. Aquilina, P. Privitera 2, M. Grech 1, G. Farrugia, J. Zerafa Gregory 2, I. Riolo 3, J. Napier 1, L. Falzon, L. Caruana, M. Sciberras, G. Galea Curmi. Referees: Neville Mercieca, Stefan Licari. San Ġiljan: J. Tanti, D. Ciantar, A. Galea, B, Grech 1, K. Dowling, M. Zammit 3, B. Plumpton, C. Farrugia, T. Said, Darren Zammit, P. Fava, Dino Zammit 7, T. Micallef, M. Ortoleva 1. Sliema: J. Sammut, K. Tanti 1, N. Saliba, J. Sciberras, M. Meli, B. Cachia 1, M. Spiteri Staines 1, J. Saliba, M. Cordina, D. Fenech 1, Z. Mizzi 1, N. Bugelli, Z. Sciberras. Referees: Mario Dalli, Ronnie Spiteri.